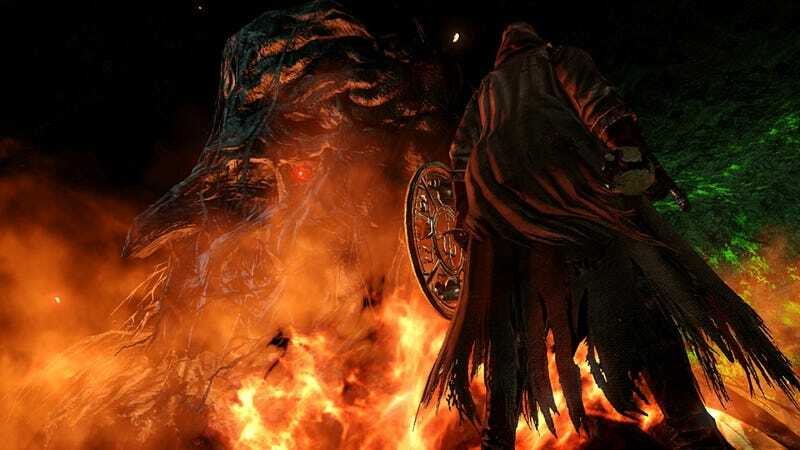 Bandai Namco's has released details on a major patch for Dark Souls 2, which both tweaks a bunch of game elements and tries to address a major flaw with the game's multiplayer. This patch also lays the groundwork for The Scholar of the First Sin, an expansion arriving in April. "Players will gain access to a new item: The Agape Ring. When players equip the new Agape Ring, souls collected from kills during online play will be absorbed by the ring rather than the player. This allows players to control their online matchmaking experience by limiting their total souls collected." First, that's a terrible name. Can you imagine what a Google search brings up for Agape Ring? A big component of the Souls games is joining up with other people. Summoning means you're purposely bringing someone in to help out with a tough section. Invading means you're ready to cause chaos. Short of unplugging your machine from the Internet, one has little control over invasions. It happens. Getting wrecked by evil strangers is part of Dark Souls. Good times. Leveling up happens by defeating enemies or players and collecting/consuming souls, aka experience. Your soul count is different from your soul memory, however. Souls can be lost if you die and fail to reacquire them from your corpse, but your soul memory is how many you've collected in total—even if you lose them. Soul memory is how the game matches up players, as matchmaking happens in the background. You cannot, say, invite a friend into your game. Dark Souls II assumes players are leveling up as they play through the game. It seems reasonable, right? So within a certain range, the game matches soul memories to comparable soul memories during summons and invasions. In theory, the soul memory system prevents really powerful players from being jerks and jumping in to ruin the game for new players. He wants to help players who are having trouble but doesn't want to be overpowered, either. Even though he's not leveling up his character, his soul memory keeps going up and up, so the game assumes he's more powerful and should be matched with more powerful players. This is also a big improvement for player vs. player interactions, since your soul level and memory are now in check. If you want to run around as a level one character forever, you'll always be matched up with other level one characters, so long as the ring is equipped. But this comes with its own drawbacks. The Agape Ring is seen as a band-aid for the soul memory issue in Dark Souls II because the fix requires equipping a ring at all times. Ring slots are precious in Dark Souls and can have profound effects on the character you're playing as. Being asked to permanently equip a ring because the game's flawed isn't a great solution. Still, it's a fix that should make players happier. The rest of the patch notes are listed here.